The sculptures, left from Sinje Ollen, are inspired by a famous toy. Photo by Kristin Corman. IS it possible that their fledgling flower business will not be a smashing success when one considers that owners Louis Gagliano and Stefan Handi do it all, plus some more? They visit homes/businesses to solely suggest arrangements. If commissioned, they make the arrangements, too. For special occasions, such as weddings, they work their magic. Further, at special times of the year, the Christmas season for instance, they are available to undertake the most elaborate decorating projects or something as simple as a wreath of various species of shrubs. Moreover, they create landscaping aka softscaping in container gardens. “We spend a lot of time with flowers,” LG gives me to know during a chat the other day shortly after returning from uprooting something from a nearby garden and replanting something seasonal. 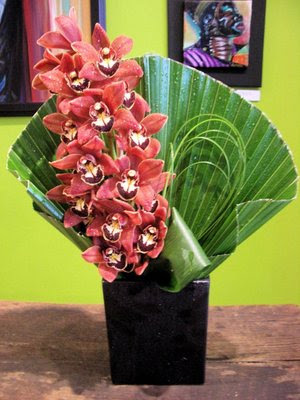 An arrangement of Cymbidium orchid with palm. Photo by Stefan Handi. 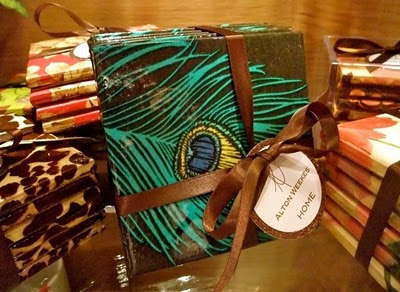 Harlem Flo, in the heart of Harlem at Frederick Douglass Boulevard (8th Avenue) and 122nd/123rd streets, also delivers. To Paris, Texas and, PARIS. Even Timbuktu with the right connections. How so? It’s simple, really. 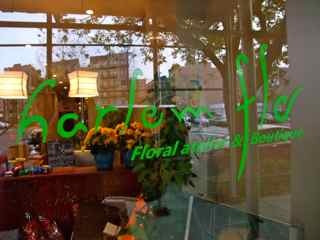 Harlem Flo belongs to a flower wire service of florists around the globe. LG and SH consult with their client, then locate a florist in their network in the designated area; dictate what they want; it is recreated. Et voila! How wonderful it must be to send/receive one-of-a-kind amaryllis-themed bouquets at Boston and Belarus at prices that range from around $90 domestically and $150 internationally, including delivery charges. At the moment, Harlem Flo is also bullish on red and green dogwood branches, peonies and, not surprisingly, holly and evergreens. “We buy what we like,” says LG. A view from the sidewalk of the Harlem Flo Floral Atelier gift shop. Photo by Stefan Handi. The partners have an extensive background in the flower business and floral design. Each worked for top floral designers and event planners before striking out on their own. Harlem Flo is three years ago, but it existed as Harlem Flo under other ownership. Neither man is saying on the record why it failed in its previous iteration, but both believe it will now be a success, because as LG points out, “we do more than flowers.” Further, they are not absentee owners as was their predecessor. “When people come in here, they want to see you,” LG remarks of customers who desire a relationship with ownership. This is particularly the case for businesses in Harlem that are not black-owned, gentrification notwithstanding. These days, the two toggle between the flower shop and the month old Harlem Flo gift shop one block south on Frederick Douglass. Like the flower shop, it dropped into their laps when a previous business folded. It represents not so much an expansion of products as a literal expansion of space for the express purpose of displaying the many wares Harlem Flo carries. Heretofore, they were obscured by the flowers and plants crowding the flower shop. “People come to us because they want flowers, but they want other things, too,” says LG by way of explanation. 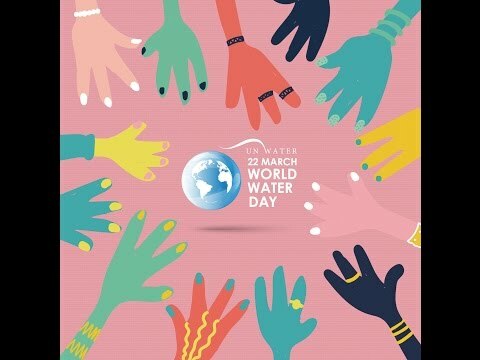 Some of these other things — many from neighborhood, local and regional artists — include books, jewelry, candles, vases, hats, this, that, and the other. 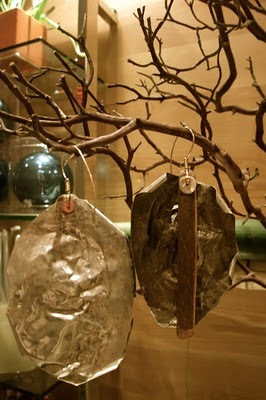 Ajuwa's distressed metal earrings are almost as light as a feather. Photo by Kristen Corman. Ajuwa’s creations from her Metal Fabulous don't appear to be earlobe-friendly but are very light. Hanging from an earring tree elswehere in Harlem Flo gift shop is an assortment of fetching solid/glass beads and stone affairs ($24 to $48) from Lilylove Designs (www.lilylovedesigns.com). Creator Christine Tomczyk, who at the gift shop opening party last week tended her stock like a mother hen, makes them all herself by hand. She has been at this business since she was in grade school. Coaster sets bear various designs ($35/4; $35/6) and the imprint of stationery designer Alton Weekes (www.altonweekes.com). At the party, he was over the moon because he recently signed with an agency that will peddle his work the world over. Several items, including handmade greeting cards ($5 a piece) from graphic artist Lian Ng (http://www.lian-ng.com), catch the eye. The mitsumata branches are both flinty and pliable under the right conditions. Photo by Kristin Corman. 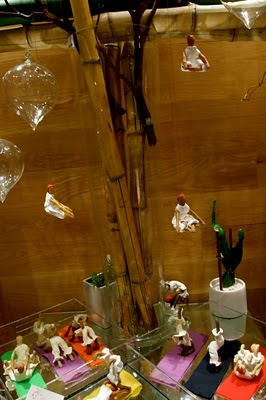 Nearby, Sinje Ollen’s miniature people sculptures ($55-$125, www.anneragg.com) hang out to interesting effect. Hard to imagine they were inspired by a Raggedy Anne doll. 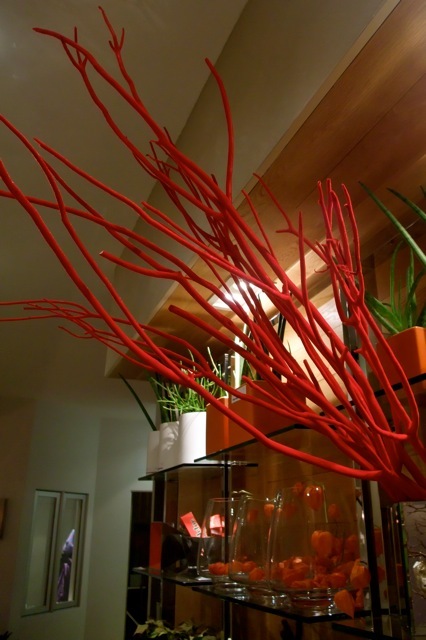 On a top shelf near the back of the space and in a bin on the floor, branches covered in fire-engine red velvet lure a potential buyer into the shop from the sidewalk. The young man is enthralled by them, piquing the interest of Yours Truly. Vital stats: Mitsumata (Small, $3-$4; large, $8-$10) is the name. For centuries, bark from the branches have been used to make paper. While pretty sturdy, they become pliable if soaked in water. They are good for various arrangements of candles, crystals, flowers and so on. According to SH, mitsumata branches are hard to come by in New York. He imported them from Asia. Sitting on the front counter of the shop is an amaryllis plant ($85) that acts as an unofficial greeter. Two of its bulbs have been forced wide open, while two others are stubbornly closed as tight as a fist. “There gonna die soon,” LG predicts. Books, including the classic, “Crowns” ($27) about women with “bad hattitude,” stare back at a viewer in a room off of the main space. Just across the gulley in small, decorative cans are candles ($12) from Pennsylvania-based Carousel Farm Lavender (www.carouselfarmlavender.com). Lavender crumbs are embedded in the wax. Alton Weekes coaster sets are available in various sytles. Photo by Kristin Corman. Back out in the main space at the window, eye candy galore at price points galore. Practically EVERYTHING, except Flo, the calico cat with a beautiful dark-brown coat, is for sale at both the flower and gift shop. Over the cash drawer in the gift shop are ferns that resemble reindeer antlers. They are attached to a small, wooden slat. The slat is mounted on the wall. The ensemble is what it appears to be — live wall art. And, yes, it is for sell ($75).